The Lincoln Bridge is two minutes up US-4/Woodstock Road from Deer Brook Inn! The bridge is 136 feet long, was built in 1877, and spans the Ottaquechee River. Middle Bridge is also in Woodstock and just further along US-4 (NE). This 139 foot-long bridge was totally rebuilt in 1969 and also spans the Ottaquechee River. The Taftsville Bridge is another 10 minutes or so up US-4 from Middle Bridge. This bridge is 189 foot long with a stone pier near midspan. 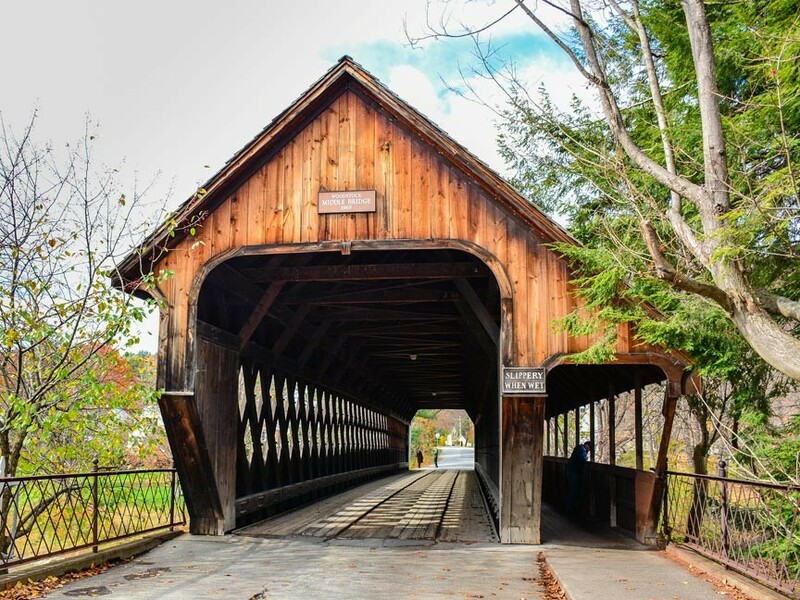 This bridge was built in 1836, making it one of the oldest covered bridges in Vermont. It, too, spans the Ottaquechee River. Continue along US-4 for around 3.5 miles (5.6 km) until you come to Waterman Hill Road. Take a left on Waterman Hill Road towards the Ottaquechee and you’ll soon see the 70 foot long steel span of Quechee Bridge. This bridge was built in 1970. Don’t miss Simon Pearce while you’re here! Their flagship store/restaurant is right here in a restored 19th-century mill, overlooking a waterfall on the Ottaquechee. Don’t miss visiting them while you’re in the area. Head back from the Quechee Bridge across US4 and onto Quechee Hartland Road/SR-4. Stay on SR4 for around 8 miles (12.5 km) then take a left on VT-12 S. Follow this onto US-5 N, then keep your eyes peeled for Martinsville Road, coming up very shortly on your right. Follow the Martinsville Road to the Martins Mill or Martinsville Covered Bridge. This is a 135 foot long bridge was built in 1881 and spans Lull’s Brook. Head back up Martinsville Road to US-5 N. Stay on US-5 N for a little over 4 miles (6.5 km) until you see Mill Street on your right. Follow Mill Street until you come to the first of the Willards Twin Covered Bridges. This is the newer bridge, built in 2001 and about 80 foot long. You should be able to clearly see the original Willard Covered Bridge, which was built in 1870 and is 128 feet long. Navigate back to US-5 and head south. Stay on US-5 for about 9.5 miles (15 km), until you come to Bridge Street. 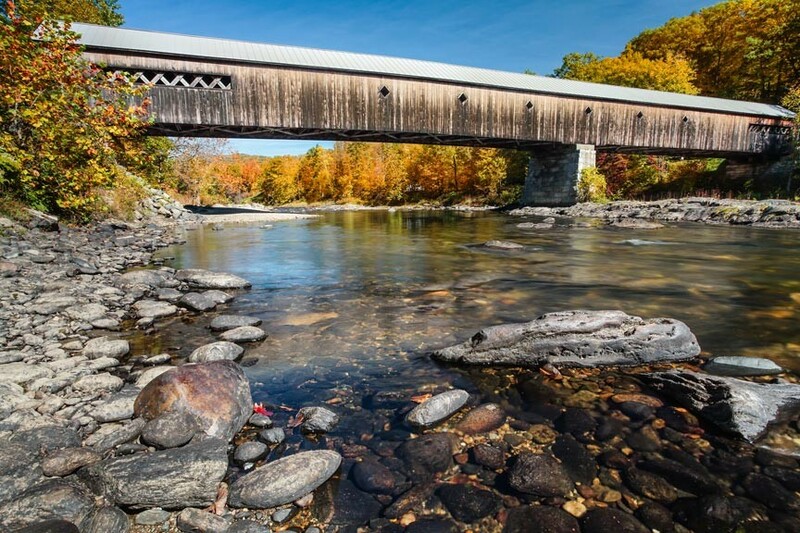 Take a left and follow this for a short while, until you come to the Connecticut River and The Windsor-Cornish Bridge: the longest covered bridges in the United States! 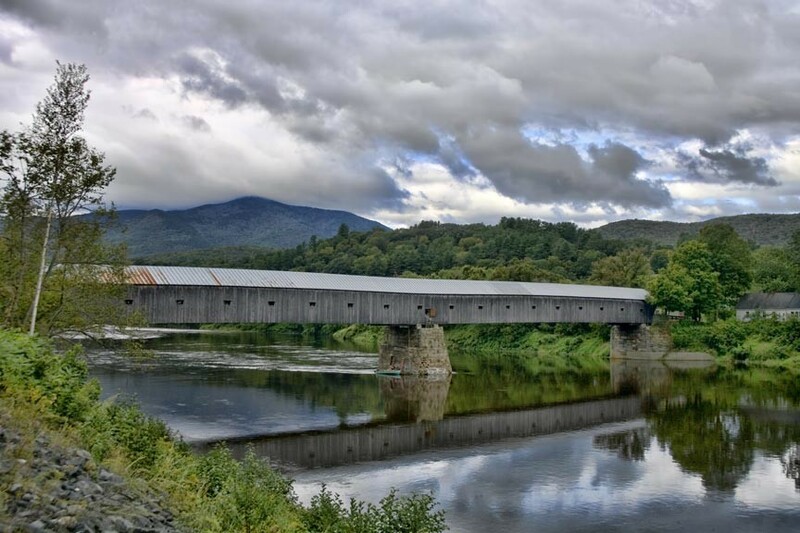 The Windsor-Cornish Bridge is a two span, 460 foot long covered bridge that was built in 1866. The bridge crosses over the Connecticut River into New Hampshire. Take US-5 N to VT-12 N, then onto US-4 W to make your way back to your Woodstock, VT home away from home, Deer Brook Inn. There was endless temptation to keep adding bridges onto this list. From each bridge profiled, it seems, there is another covered bridge just 5 to 20 minutes away. When you stay at Deer Brook Inn for your Vermont vacation, we’ll do the best we can to help you make the most of it!